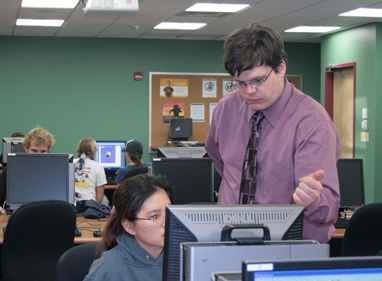 Since 2003 I have been teaching Computer Science 391: Fundamentals of Graphic Communication, an interdisciplinary course I originally developed with my advisor Professor Beverly Woolf and with fellow graduate students Shaun Kane and Brandon Goldsworthy. This course consists of three units which introduce students to the software tools and design theories relevant to graphic design, 2D animation, and interactivity design. Over the course of the semester students generate an array of materials including promotional documents for a fictional band, a short 2D animation created in Flash, and a simple interactive "Escape the Room" game also created in Flash. As the lead instructor of the course for several years I have been responsible for all grading, lectures, activity planning, and development of tutorial materials for technical documents. I have each year supervised and trained a team of undergraduate teaching assistants for the course.